Three days later, Ritik and Shivanya reached India. Shivanya’s dad came to airport. Both are afraid. But Ritik determined to go further. He hold Shivanya’s hand tightly and moved front. Andy stopped them. Andy: do you think, i will leave you that much easily Ritik? Shivanya(pull up courage): dad, leave us. We have to go. You can do anything afterwards, it’s urgent. Andy: you go anywhere. I will take my son in law with me in my car with all respect. Both look at him awkwardly. Andy: don’t worry, i will take you to your house only Ritik. This is order given by my wife. Afterall, husbands should dance to the rhythm of wife na. Both look at him surprised as well as suspiciously. He didn’t let them escape from him. He forced them to sit in car and he drove. He stopped the car in Ritik’s house. Both stepped out of car. Whole house is decorated. Both are surprised. Sumitra and Yamuna stand out with huge smile in their faces. Both moved forward. Before they open their mouth. Sumitra gestures them to silent and take aarti. Rishi came out and keep his hands on his mom’s shoulder from behind. Yamuna joint her head with his and smiles. Ritik gets emotional and hugs his mom. Rishi: Ritik sir, how are you? Ritik: Rishi, i am your brother, now also you are calling me as sir. Rishi: yeah bhai, i am used to it. You know what i didn’t speak with mom for one day for not telling about you. Yamuna smiles; Ritik feels for Rishi because he not yet know about his mother’s fate. Andy: Ok, shall we go inside, if you finished your talk? 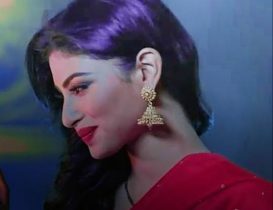 Ritik and Shivanya look at him with surprise. Sumitra: i will explain you later, let’s go inside. Lavanya is waiting for them inside with excitement. Shivanya embaraced her with emotion. Sumitra: there is another surprise for you two. Your dad not only accept you both but also your sister and Rishi. Andy: yeah, Rishi and Lavanya are going to get married. Shivanya(hugged Andy): thank you dad, thank you so much. Ritik: uncle, are you sure? But how it happened? Yamuna: Rishi beta, will you take Lavanya to her room? Rishi understand that they don’t want them there. But why? As far he know there is nothing in Andy’s change. He is changed because of his separation from his family members when Sumitra also left him. But why they don’t want them? After Rishi and Lavanya left. Yamuna: Love is only thing which will be alive in this world after to our death. Our love and kindness towards others will be alive after our death. Sumitra: yeah, absolutely as bhabi said. Your dad understood it now which he once lost years back. Andy: Your mom proved it Ritik. Her days on earth is not so long, just 1 month or more. But she will live in everyone’s heart after her death also. She is going to donate her eyes to Lavanya. This human nature na. I lost it due to greed. She and Sumitra bring it back by proving it. He can’t able to speak. Yamuna hugged him with tears. Others eyes filled with tears. Rishi is standing there with shock.